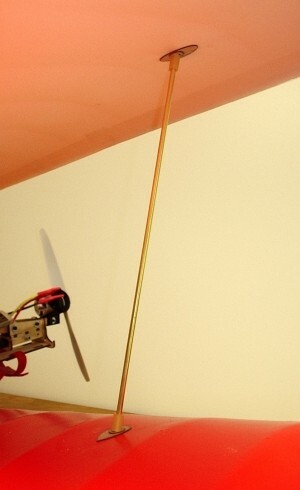 The GWS Slow Stick is a great platform for almost any electric RC activity. It's made with low cost in mind and it works fairly well right out of the box. However, did you ever wonder what it would be like to have one setup with all the nice hardware? On this page, you'll find those goodies. Improved motor mounting systems, control horns, landing gear choices and etc... Also, there are many parts here to make reconfiguring the kit into other types of models easy. Ever wonder how they fly V tail? Would tricycle gear be cool? Want a great camera mount? How about a twin, tri-motor, quad-motor, 5-motor or even multi ducted fans? Do one up with all the nice parts one time and you'll never go back. More complex upgrades come with an instruction sheet. The simpler stuff, all you really need is the web photo to know how to put them together. Some items are not complex enough for instructions but might include a few pointers in the description. Generally, I sqeeze the kits together first, then wick thin CA into any joints requiring adhesive. Nothing here requires any other type of adhesives. Obviously others may be used if you prefer as adhesive choice is non-critical. Construction is straight forward with most items having only 1-4 parts to make them up. Extensive E-Zone discussion of these parts and many hybrid projects here. Direct Link To: Factory Slow Stick Parts. We have 4 pages of "SPECIAL" upgrade parts below. Now, let the fun begin! 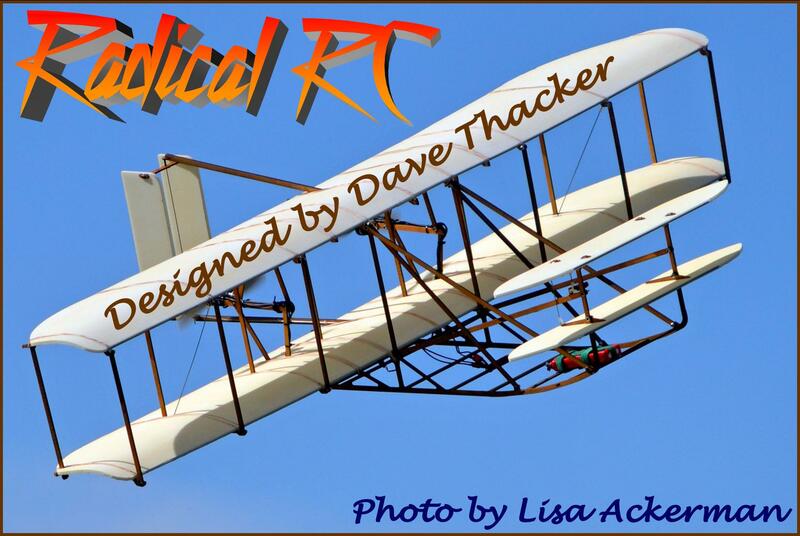 Did you ever get to see a Wright Flyer fly? Did you ever dream that someday you'd get to wiggle the wings on a Wright machine? I'm betting during all those many months of testing, planning, designing our famous Wrights went to bed wondering what it would be like. Then they did it. Now, you can do it. 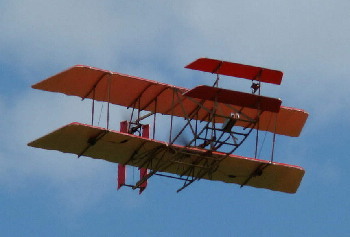 This conversion kit combined with the parts from two GWS Slow Stick slope glider kits (available seperately) will produce a sport scale 1905 Wright Flyer. This model from the side view is scale having all the struts the original had. Omitted are all the flying wires and control cables. All the fiddly bits included on a perfect scale model (that break every time you land one) are gone. My intention was to design a model you could fly 10 times in a day if you liked and not once or twice a year for special occasions as you'd probably choose to do with a pure scale model. How does it work? If you look close you can see our unobtrusive elevator servo (we used a GWS Pico) on the canard support strut. This servo drives the top canard which in turn, drives the bottom canard through a simple transfer rod. 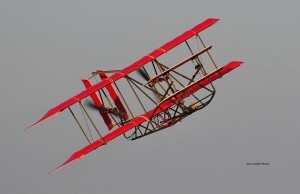 The canards move up and down together on thier own individual pivots like the original 1905 flyer. The rudder servo is adhered to the bottom of the bottom wing with a Dubro Micro Push rod (1/32 wire in clear plastic tube) driving the rudder. The rudder moves like the original 1905, both together. Perhaps the most exciting feature is this model flys with real wing warping. 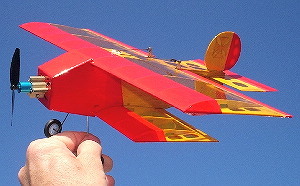 The outside wing strut assembly has a servo hidden under the bottom wing driving a diagonal rod that appears to be a simple bracing rod in the scale location. Forget the Eindecker like wings, wouldn't it be gross if this model didn't turn by real wing warping? You're going to love this feature every time you show how it works. How does it fly? I was amazed, after some initial hiccups working out the right setup. We've refined CG and throws until it flies more or less like you'd expect a trainer to fly. It is a bit draggy so you tend to fly with a middle throttle position most of the time and you will want to be comfortable flying with both hands as this design likes rudder inputs. However, you'll soon agree it flies like a trainer. Provided in the kit is the CG you need along with servo horn lengths, control throws and even exactly where to trim the canard for that first flight. How does it build? This is not a normal kit, it's mostly nut and bolting with some foam trimming and fitting here and there a little gluing and some finishing (staining). If like me, your favorite ever childhood toy was an Erector set, you're about to feel young again! Now I know you hated those square nuts and slot head screws (I did) so we included all hex wrench driven button heads and ny-lock nuts. There is a surprising amount of aircraft ply in this kit. The main structure starts out as a 24"x24" section of 1/8" thick air ply (cuts slower on a laser) and it's packed tightly with many parts. Needless to say, there is a lot of laser cutting time here. It has the longest hardware list of any kit we've ever designed and the longest instruction set I've ever written including several drawings/templates. Ron, who built both of our in-house prototype models said he needs 3 work days to complete one. So, please plan enough time, it's very important to us that you actually finish it and get it flying. I want to hear the joy in your voice and see the pride on your face when you tell me about it at the next show. Whats included? All the hardware needed that isn't already in the Slow Stick kits is included here. All fasteners are good quality allen head bolts with lock nuts. There are 88 washers and you can guess how many nuts and bolts. What do you need to complete? Add 2 motors (max 2oz, 800-1200 KV), 2 stick type motor mounts, 2 ESC's, APC counter rotating prop set, electronics (2 each 6 gram servos, 2 each 20oz torque servos (we used HB-65's)), and 1 3S battery 1800-2200mah. Extensions and Y's. For motors under 1000 kv, use 10-4.7 props, 1000-1200 kv use 10-3.8 props. Direct Link: wright Stick Build Log. In Flight Video "GalaxieX" from Canada." 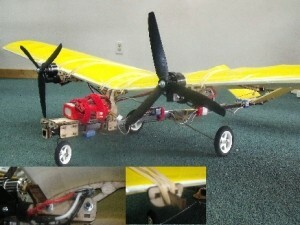 Configured with custom gear and FPV system. Looks like SUPER FUN! Contains wing mounts, servo mounts, boom joiner, battery tray and push-rod guides. No nuts/bolts/screws included. As individual parts packs The only way to get a wing mount set is by buying the Plastic Parts Spru or an entire X-Fuse set. Individual parts packs are no longer supplied by Millennium and will be deleted from site as they sell out. The GWS Slow Stick is a fun model right out of the box in stock configuration. Adding an adjustable thrust line motor stick allows you to trim in down and right thrust to suit. Imagine going from cruise to wide open throttle and the model does not automatically go into a loop! Makes the aircraft much smoother and more trim neutral whether flying around or doing wacked out 3 channel aerobatics. Comes in an easy build laser cut kit. All fasteners and washers included. Good SAE socket head fasteners. Simply build the kit, remove your motor mount from the GWS motor stick, slide our mount on, bolt to fuse, put your motor mount on the adjustable stick and run the bolt through. Now do some trial flights and adjust to taste. Allows for thrust lines from 0-8 degrees down and 0-3 degrees right. Useful for Millennium RC SSX and SS Trainer kits or for Sticks turned into Canards as it works just perfect in pusher configuration. Fantastic addition to any Slow Stick being used as teaching aids as the thrust line may be adjusted to demonstrate effects. Same adjustable thrust line motor mount with built in nose gear mounting block. 2 parts built into one with advantage of getting the nose gear further forward for more stability. Nose gear is bent to any length desired from 3/32 music wire which you provide. Wheel collars (DUB138 suggested) and wheel not included. I used a spare 1 1/4" long 4-40 socked head cap screw as a tiller arm replacing the setscrew that secures your bent gear wire into the pillow blocks. A section of fuel line to bind a push-rod to the tiller arm. All other fasteners included. See out standard nose gear block for another photo of this hardware setup. Replacement Motor Stick for our Adjustable Motor Mount Mount Kit. Single ended stick with mounting slots. Each package 2 sticks. Ever want to setup your bird as a pusher? Maybe you have a front mounted camera system and wish to remove the prop from your videos and photos. Mount is adjustable for down thrust over a nice range making an otherwise tedious trim adjustment easy. This mount was designed to be used as the wing mount also. If you wish to use only the motor mount without wing mount, that works well also. 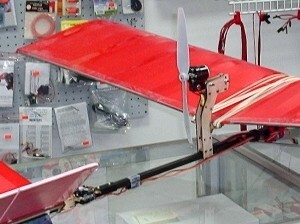 In a recent project (and I expect most people will) we used it as the wing mount system as well. It gives you 1" of wing rise which is popular already. Choose only your dihedral angle perches below. Good quality socket head fasteners are included. Designed for use with props up to 10" using normal motor mounts. Mounts that put the shaft of the motor close to the stick like the 10mm Tower Pro Motor Mounts and the 20mm motor/stick mount setups tend to move the motor closer limiting the prop diameter to 9". If the entire motor body is above the motor stick a 10" prop will fit. Special Note: It has been observed that this mount may be used as a forward facing (tractor) motor mount also. 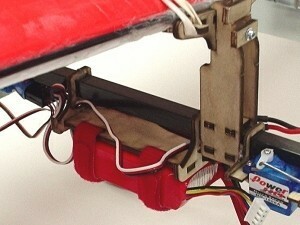 For under-boom mounted forward facing camera work, it is often desirable to raise the motor up to get the prop arc out of the photograph. This mount facing forward on the nose accomplishes just that while still allowing you to adjust for proper down thrust angle. Replacement Motor Stick for our Adjustable Pusher Motor Mount. 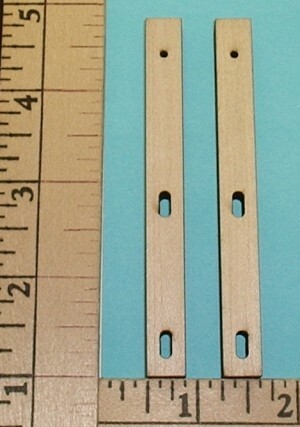 Single ended stick with mounting Holes. Each package 2 sticks. At last, an easy and low cost high performance Slow Stick Twin. Gone are the days of strapping a heavy boom to the bottom of the wing with the resulting up thrust and poor handling. You can have a twin and have it fly correctly! With the Radical RC twin conversion kit you can make any Slow Stick into a twin. You can even make it into a 4 engine WWI Faux Bomber if you wish (with 2 kits). Our kit does not alter your wing in any way, attaches with simple rubber bands so you can always alter or return to a prior configuration if you like. Optionally; cut the tail off this mount and glue them into your wing for a permanent band free installation if desired. Each kit comes with 2 mounts and high quality socket head fasteners. For those wanting to configure a forward looking still or movie camera setup without prop interference, you've just gained an excellent option. Check drop downs for motor and ESC combo specials to go with this item. Combo A-Brushed = 2 each 370-B gearbox's and motors, GWS 480 ESC, 2 JWT female pigtails & 1 set of GWS 8-4 x3 Blade Counter Rotating props. This set will provide excellent performance with straight up climb yet speed controlled just right for the Slow Stick. Wide open throttle time should be limited to 30 seconds, current will be about 10 amps per motor at WOT, max continuous is 8 amps. Who would have ever thought you could setup a high performance twin so inexpensively! Don't assume brushed setups can't be high perfromance, this system will really rock! The Price is OUTSTANDING!! COMBO-B-Brushless = 2 each GWS 002 Outrunner, 2 GWS 28mm outrunner mounts, 2 Brushless ESC's, 2 sets 3.5mm bullets & 1 set of GWS 8-4 x3 Blade Counter Rotating props. Although bullet-like connectors come with the GWS motor, anybody with an ounce of sense changes them to real gold bullets. This setup performs nearly identical to the brushed above for a few amps lower draw. All COMBO choices require soldering your harness together with parts provided. Your 3S generally 1000-2100 size pack is required. For Brushed setup, be sure to use Deans or Anderson Power Poles between ESC and battery. For brushless twin with single pack, solder both ESC's to one input plug. Replacement Motor Stick for our Twin Tractor Motor Mount Kit. Single ended stick with mounting slots. Each package 2 sticks. This motor stick is compaitble with all of our prop drive type motor mounts. Offsets stick above mount (or to side in case of SS Twin Motor Mounting System). 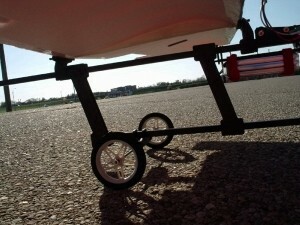 Use to get a little more clearance over the boom for a larger prop if using our pusher mount or Offset Boom Mounts. Anytime you want to lift the motor a little, this is the part. Note, some motor mount sticks have slide holes, this part is just drilled holes and stick is single sided. 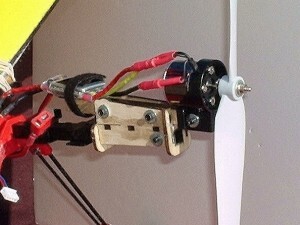 Use this stick in conjunction with our other motor mount systems to alter the up/down thrust adjustment by 4 degrees. We made these stick because we built a twin tractor canard Slow Stick and in this configuration, you actually need a small amount of "UP" thrust to acheive good cruise to glide elevator trim settings. Our stock twin tractor motor mount adjusts from zero to -8 degrees (as most of our motor mounting systems do). This part changes the range of existing motor mount systems to "+4 to -4" or "-4 to -12" degree thrust line. Each Item is 2 motor sticks. Ever want to try a Slow Stick ducted fan conversion? Here it is. Uses off the shelf GWS EDF 64mm fans brushed or converted to brushless if you like. Now, don't tell us that Eindeckers never had jet power plants, we recently obtained archived 13th generation photo copies that seemed to show plans for just such a craft. Who's to say if they ever completed it or not? We built our model with the EDF-64H GWS brushed fans and let me tell you, this model really performs. I first flew it in about 12mph winds and with the throttle stick a little below 1/2 I was hanging it in the wind about 20' over my head and it was still creeping higher! Throttle range is excellent, plenty of power to blast out of trouble and reasonable speed for a slow stick. Now, this is not intended to be a fast fan model but then those are available around every corner. This setup will climb with authority (45 degrees or better), has good flight time, is aerobatic and certainly will turn heads at the local flying field. Before they see it fly, they'll be saying "How can that possibly work? ", after flying they'll be asking "Where can I get those parts! It's amazing!" Each kit comes with 2 mounts and high quality fasteners. Combo A-Brushed = 2 each EDF-64H Fans complete, GWS 600LI ESC, 2 JWT female pigtails. This set will provide good performance for a low cost twin fan system. Model should finish about 24oz, you'll have about 14oz static thrust combined, not a bad ratio for WW1 low and slow jet fly-by's! All COMBO choices require soldering your harness together with parts provided. Your 3S generally 1500-2100 size pack is required. Deans or Anderson Power Poles are suggested between ESC(s) and battery. Solder to one input plug. NEW ITEM, should be in stock and shipping by 02/11/09. Same great performance as our twin EDF-64 mounts but all in one boom mounted unit "Wart Hog" Style. Photo shown teasingly on my very own Hog Stick to tickle your imagination. Fans slip into mounting hoops with slight press fit. Apply section of scotch tape on fan housing between hoops so housing cannot slip past hoop. Simple and effective. Down thrust is fully adjustable with this mount. Each kit comes with high quality fasteners. Combo A-Brushed = 2 each EDF-64H Fans complete, GWS 600LI ESC, 2 JWT female pigtails. This set will provide good performance for a low cost twin fan system. Model should finish about 24oz, about 14oz static thrust combined, not a bad ratio for low and slow tank pounding fly-by's! Tricycle gear made easy for your GWS Slow Stick. After seeing a friend's setup which was overly flexible needing constant adjustment, I designed this handy nose gear block for him. The GWS landing gear wire is 1 size too small. Our Nose Gear Block is made to take 3/32 or .094 wire (Part # KS506). This kit is the nose gear block only, no wire or other hardware included. Just squeeze together and wick in thin CA. You're done. It's made so a single Dubro 3/32 wheel collar (Part # DUB138) retains the wire in the block. Remove the set screw and replace with a long 4-40 bolt. Notice how we did this using a short section of glow tubing as a friction lock for the steering pushrod. Unit fits the Slow Stick fuse nicely, use a dab of Goop adhesive to lock in location on stick. Maybe you can find some other uses? The stock factory tail wheel setup on a slow stick is weak. Use this light weight mounting block to build a steerable tail wheel mount. Bend your wire gear out of .055 music wire (Part # KS503) and your all set. Notice in the photo how simply we connected ours to the rudder pushrod. What? No glow line in the field box? We've got that material also. Combine with a .063 (1/16") wheel collar (Part # DUB137)to lock the wire in place (works like our nose gear retainer) and your all set. The stock gear is a little too flexible for the models weight. When you add a larger pack, bigger motor or camera, now you're really in trouble. This mount can be used in a tail dragger or tricycle gear model. Wire size is 3/32 or .094 (Part # KS506). Just one size bigger makes all the difference in the world. Wire is locked into the gear mount with simple wire ties. Lock mount into position on your Fuse Boom anywhere you like with a dab of adhesive. Now you can do touch and goes, even bang the ground a little bit without failure. Kit comes wood (4 parts only) and wire ties. Plan for bending wire (purchase wire at your Local Hobby Shop) is included. Same well proven landing gear system used in our line of fine laser cut kits. Note, we love the Millennium R/C gear also, my personal models use both types, I can't choose which I like best. Suggest also ordering part # DUB138 wheel collars to hold on your wheels. First, use 4 of the same diameter wheels. The front pillow blocks are slightly curved, rear pair is straight. Front units go with pillow block down (axle under runners) at around the point where the sleigh joiner doubler is. Put it on the inside of the runner. Warbird Main Gear Mount. Most any WWII Theme model you build will need the main gear mounted to the wing in order to look right. (Can you believe what I'm suggesting? ;-) ) Shown here used on our shop Wart Hog theme model. Like many of our parts, this one may be reconfigured easly by simply flipping parts for tail dragger or tricycle configuration. Tricycle shown. 3/32 Music wire (Part# KS506) was bent to shape, bend any height you want. Wire may come down from inside or outside edge of mount to allow for a variety of gear widths depending on the look your going for. Suggest wheels collars Part # DUB138 to hold your wheels on. The Slow Stick wings and glass fiber rods support both front and back where we have it banded on in the photo. Takes landing loads quite well. The look generated along with your likely use of low wing moutning set and aileron kit (both available in this category) will have everybody thinking you must be flying some new just released super model. We use this part when we want to put the axle directly over or under the boom (May be flipped up or down to get high or low axle). Used in our offset boom FPV prototype. Now available to you for whatever you'd like. Setup for 3/32 wire (Part # KS506), can be drilled larger. For larger spreads, larger wire is a must. In photo we drilled axle holes out to 1/8". We used 11" long axle wire (music wire) and 3" Maxx Products (MPIEPW300) wheels in the photo. Use wheel collar to lock axle in place in gear mount. Although it is possible for the axle to turn in the mount, it is intended to be snug fit and the wheels to turn on the axle. Glued together with thin CA. The photo's unit was built and painted black with a permanent marker for that "I'm too poor to make this in real carbon" look. 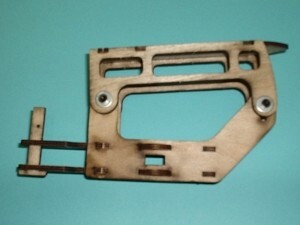 This item is the laser cut wood kit to make the Axle Gear Mounting block as shown. Axle (made from music wire KS506), wheel collars (Part # DUB138) and wheels are shown in photo in order to illustrate product use but are not included. Mounts one servo easily. Tired of the GWS mount splitting and pulling the grommets out of your servos every time you stop abruptly (crash)? A slow and tedious repair when you should be flying. Our mount is tied together to prevent this problem. Also allows mounting of servo set low or high relative to the boom. Great way to mount your single servo for nose gear, camera or drop box actuation. 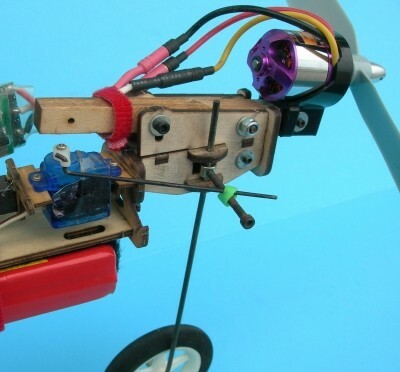 Maybe you want to move one servo back to the tail and eliminate some pushrod slop? Whatever the case, our mount gets the job done cleanly. Tip: This shot shows how to use a section of fuel line to connect a control rod. Slips easily in a bump and quick to adjust. Mounts two servos easily. Tired of the GWS mount splitting and pulling the grommets out of your servos every time you stop abruptly (crash)? A slow and tedious repair when you should be flying. Our mount is tied together to prevent this problem. Also allows mounting of servo set low or high relative to the boom. Although you can use this mount to put the servos anywhere along the boom, we've found a great enhancement putting the servos right back at the tail and using the stock music wire for short pushrod wires. You'll get rid of pushrod wire weight but the real advantage is your eliminate tons of pushrod flex, your controls will tighten up and you'll find she handles a little more solid in a breeze. Kit allows use of different size servos. I like 6 gram servos like Pico's and HS-55's on my sticks. You might think moving the servos back would cause your stick to become tail heavy but remember your eliminating pushrod weight and what your moving back wasn't up front, it was already somewhat to the rear already. We find it works out just fine and the model is still easily balanced. The stock battery mount for the slow stick is a little finicky to use. We believe it was made originally for 350 NiCads. Our mount fixes several issues. First, it has plenty of surface area if you like to use mounting Velcro. It is slotted and includes Velcro tie straps. It will retain these tie straps when the battery is not in place so no worries about them getting lost. Second, there are multiple places to easily hook on rubber bands. Any way you like to mount your battery is accommodated well with this mount. Our standard size mount will hold most any pack around 1350mah or less in capacity in the normal short profile. Any pack 3.5" long (88mm) or less fits nicely. Mount stands off slightly from the fuse boom so it may be positioned to overlap our wing mounts, main gear mounts even the motor mount if you like a forward location better. We have used this mount to suspend the battery above the boom also. It could also be used for "side" mounting if you need to balance against a camera or other onboard device that is off center. Our long length mount will hold most any pack around 2500 or less in capacity in the normal long or short profile. Any pack 4.5" long (114mm) or less fits nicely. Same notes as short and long trays except the Uber Long tray holds anything up to 9.25". Provides extra mounting surface for other goodies if you like. Long enough in many cases to provide alternate battery mounting locations if you alter the configuration of your ship from flight to flight. Weight: 18.2g/0.64oz. Building a custom Slow Stick from scratch? Wish to eliminate the weight of the factory joiner and it's fasteners? Want an even stronger Slow Stick? Here is your boom. 800mm long. 10x10mm. Exact same fit as GWS tube so all your factory parts and Radical RC upgrades will fit perfectly. I strongly prefer building our custom Slow Sticks from parts starting with 1 piece booms. The GWS 2 piece boom works perfect but I like the simpler lower parts count of one solid tube and you will also. International buyers: (Outside USA) These booms exceed the allowable length for First class shipments. 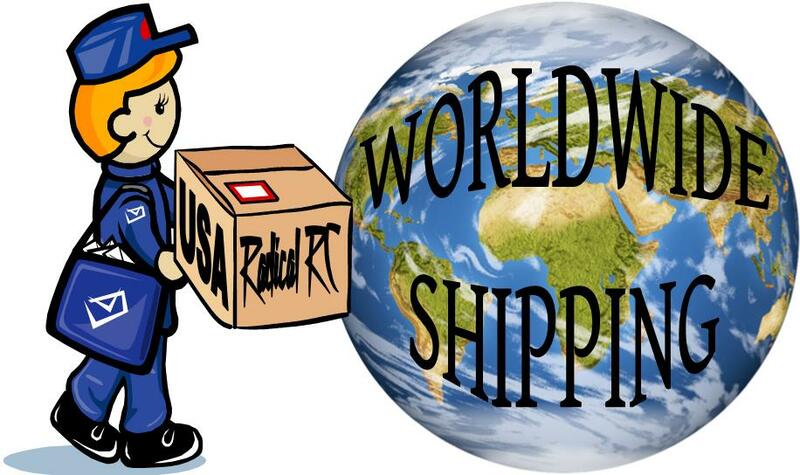 Your minimum shipping fee will be at least $20 because they must go International Priority Mail due to length. In a recent example a customer from Canada ordered 1.7lbs of goods. The First Class cost was $7, however because the boom length forces Priority Mail the cost becomes $21. The same example to UK the price goes from $15-$30. 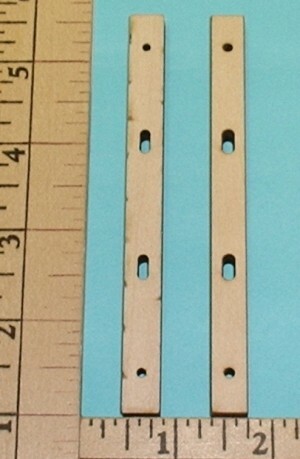 Add on section, semi random length approximately 7.75" - 9.00" for constructing added length models. Extending the stick is nearly a must for your rear motor Canard or Pusher conversions. Anytime you need a little extra boom length for any reason it's simple to add on with this part and a boom joiner (sold separately). Molded joiner sleeve. Use to attach boom stock end to end. Useful to replace broken or lost factory part or for making that extra long fuse version you've been planning. Use glue to lock joint or drill and bolt in traditional fashion. Fasteners not included, part is un-drilled. Discontinued by Millennium R/C, sorry! Tired fussing with the tiny rubber band pegs on the stock GWS mount? Wishing you had more or less dihedral? 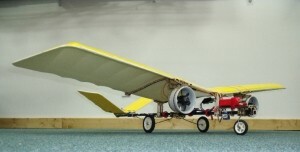 Want to raise the wing up and make a true high wing out of it? Maybe you need to raise the wing and make room for your camera? How about a Low Wing Slow Stick? You've found the parts! Generally, as you add dihedral and/or raise the wing up you get more yaw induced roll. This is to say your rudder will be more effective. The stock dihedral is 12 degrees. Maybe you're looking for a flatter wing layout to help make ailerons more effective? Also, if you have ailerons, you wish for the yaw to be more pure yaw and less roll. All these parts are here to aid in your experiments. Incidentally, you'll have to bend your wing tubes for these higher dihedrals. This isn't too difficult if you have reasonable hand strength, insert carbon rods to aid and pull around a corner like the side corner of a pine 2x4. Select Wing Mount Riser Lift first: -1 is the low wing set moving wing below the stick; 0 is near or like stock; actually my 0 starts just a fraction higher than factory mount; 1"; 2"; and 3" (refers to "inches" higher than the my 0 mount). Next, select the Perch Dihedral...Note, 24 degrees recommended for low wing risers: 0 degrees (flat); 5 (less than stock); 12 (stock); 16; 20; 24; or 55 for a whacked out 3 channel rolling monster. 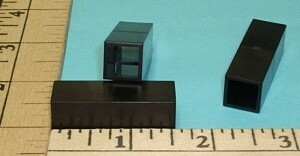 Photo shown is 1" Risers and 16 degree Perch set. Need repair parts? Get 1/2 a wing mount set here. The riser is the vertical leg set (4 parts) that fix the distance from boom to wing mount surface. 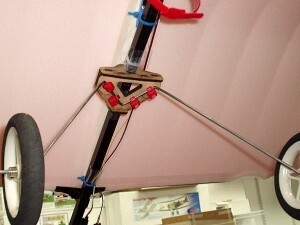 The Perch sets dihedral angle, is the mount surface, rubber band pegs, and the horizontal parts that fit between the risers to form a box to slip over the boom. Slow Stick Biplane made easy! Lots of us have wanted to try this but few have taken time to make all the special parts required. Now you don't have to make anything. Let's be clear, you only "thought" you had a "Slow Stick", you'll really have a "Slow" stick after doing this conversion. 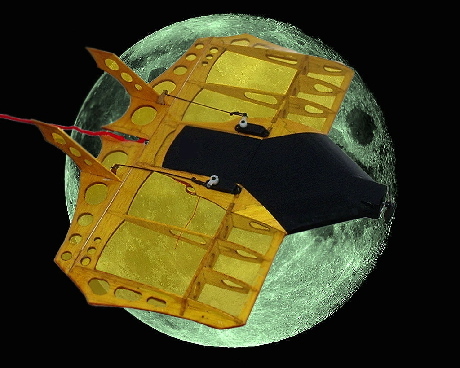 If you like backing up on a breezy day, you'll be moon-walking with 2/3 the breeze once you've doubled the wing area. 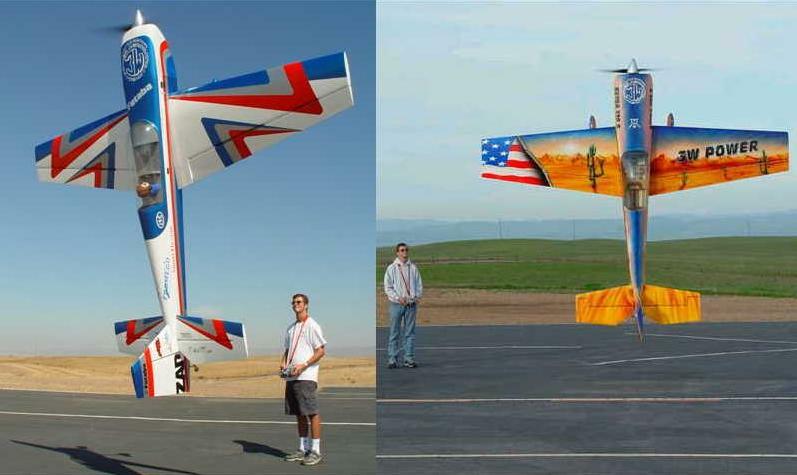 A Biplane conversion also looks much bigger. What an imposing presence your new Bipe will have among the lesser endowed Slow Sticks at the next Fly-In you attend. Like our mono-wing mounts above, you must choose the wing perches you want to match your desired wing dihedral. Our shop model uses 24 degree perches (as shown in the photo) and to me it feels just perfect. More dihedral gets you a more "active" roll function when you put in a rudder command. Conversion kit work just fine with stock dihedral (12 degrees) if you like but expect roll control to be soft. Choose the perch set that you think best matches the personality your going for in your new biplane. Correct CG for this wing mount set is 5 3/8" back from leading edge of top wing. Note one strut set has an "F" etched in and this is the "Front" mount. Many ideas are open for experiment and consideration. For instance many biplanes use a shorter bottom wing and at times the dihedral angle may differ slightly from top to bottom. Release your imagination and be creative. The wing struts are an option listed on this page. Not required but aid in stiffening up your wing assembly and add a dash of "looks right" to your dog-fighter. 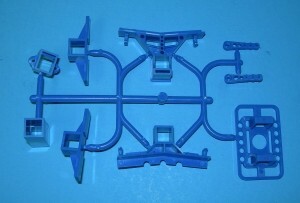 Wing riser spreaders (look like a letter H) are included with all the perch sets and are needed to complete the wing risers for all the mono-wing mounts. These parts are extra and discarded when you build the bipe setup. This bushing set allows you to build the hard points for mounting simple shaft type struts into your Slow Stick Biplane conversion wing panels. Made from 1/64" thick aircraft ply. Rods are not included. 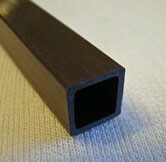 You can use carbon, fiberglass, aluminum or brass tubing as we did. 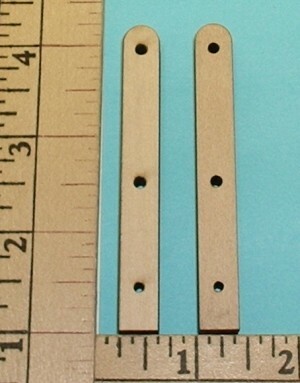 I think lightly stained 1/8" wood dowel would look very trick as well; anything about 1/8" diameter. I choose the more antique look of the brass on my biplane. I wonder if my more period correct SS Biplane would qualify for Top Gun now? Installing these hard points still allows you to use the wing panels on other monoplanes. The strut shafts are passed through the hard point with a section of glow fuel line pressed on the shaft and slid up against the hard point on both top and bottom. Locate where you like, we put ours on the high point of the airfoil (about 2 3/4" back from leading edge) and in the middle of the second section of sagging cloth (what the wing shape simulates) as counted in from the wing tip. Mark these spots carefully, glue the teardrop shaped piece on top of each wing panel. Now, mount your wings on your airframe. We cut our rods to 10 1/2" as this seems to leave the right amount sticking through. By hand carefully cut or drill your 1/8" pass through hole for the rod. Now, slip two 1/4" long sections of fuel line about 1.5" onto each end of a strut shaft. Place a 1/4" ply washer on each shaft end followed by the oval washer. Now install the rod between the wing panels. Slide the oval washer up to the bottom of each wing (orient it span-wise) and glue in place. When this has set, glue the 1/4" washer in place over the oval washer. Glue in place the 1/4" washer on the top surface (on the teardrop). The rods are now held in place with two more sections of fuel line on the tip. Using the rods as a jig to align the strut bushings (hard-points) is a real help. As you can see the rods go through the wing at an angle because of dihedral. Aluminum tubes required to build a straight wing, no dihedral Slow Stick Wing set up. Easily Bent to your chosen Dihedral. Note the pre-bent GWS 12-degree tubes are discontinued. Good precision fit to factory 3mm spars and a little longer than factory part at 3" to reduce spar wobble inside of tube. Use these tabs to mount your own special projects. Get a good fit the easy way! Made from 3/32" thick (2.5mm) aircraft grade plywood. Great for uses such as mounting cameras, drop box's, custom battery trays, alien gravity variometers and etc.... Each package includes 4 tabs. Use these tabs to mount your own special projects. Get a good fit the easy way! Made from 3/32" thick (2.5mm) aircraft grade plywood. Great for uses such as mounting cameras, drop box's, custom battery trays, flux capacitors and etc.... Each package includes 4 tabs. Use these tabs to mount your own special projects. Get a good fit the easy way! Made from 3/32" thick (2.5mm) aircraft grade plywood. Great for uses such as mounting cameras, drop box's, custom battery trays, ghost detectors and etc.... Each package includes 4 double mount tabs. Mount two accessories on your stick. Our heavy duty Slow Stick mounting tab. Made from 2.5mm Aircraft Ply. Rugged, can be used to mount anything a stick can carry. Big enough to hold Dubro's 1/2A nose gear set if you like. Each kit is one tab, super quick to build and nice fit on your fuse boom. This special part allows you to glue in place a stop. Great for setups you want to be able to dismantle quickly. We made this part for a Slow Stick in the shop that the owner setup to take down and fit back in the box after a flying session. He can glue use these stops to set the location of one of his wing mounts. Another interesting use is as a spacer to set the distance between accessories. Also useful as a slip on bushing to glue your special projects to. Laser cut from 3/16 aircraft grade plywood. Rugged enough for most any use. Each package contains 4 stops. Use to offset a second boom from your main boom. Imgaine a Schiender cup racer but rather than a float centered under the fuse, we're adding a second boom. Original intention is to locate a second boom below your main boom to hold landing gear, battery and camera mount for FPV experimenters. In this way (with other parts available separately) Can be used to configure Slow Stick for single tractor motor with camera position in front of prop if you like. Other uses are possible, perhaps you want to put a boom up above your wing to hold motor or camera above prop. Use your imagination with this special kit. On model in photo parts are colored black with permanent marker. Made from laser cut 3/32 Aircraft Plywood. This kit offsets second boom with 4 3/8" gap. Get rock solid control of your surfaces with these horns. Made to fit the precut Slow Stick holes exactly. No more wobbly bendy horns slopping up your flying performance. Ever wonder how much the in flight wind loads move them around? I say it does a lot and this is mostly because of the sloppy stock horns. Pick up a few MPH of wind and you can still fly with this mod. Also, she'll fly smoother when you actually get 100% of the throw you command. Solid control, that's where it's at! Horn set is two complete horns, glue into the foam tail parts with foam safe CA. The horn is made from 3 parts providing lots of support on the surface of the horn. There is no substitute for straight stiff control rods, make sure your control rod setup is right to get the very best from these horns. Trick parts for adding Ailerons to your slow stick. These horns are special and differ from the tail horns. Comes with servo mounting pads, stick these down with Foam Safe CA, GWS glue included with Slow Sticks or any other foam safe adhesive. Pad is made from 1/64th aircraft ply so it is flexible and will match contour of wing easily. Glue servo (CA or Goop) to pad. 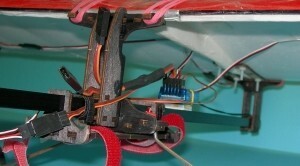 (servos glued directly to the foam can be torn off easily). Spacers are provided so you can adjust horn to fit 4 or 5mm thick wings. Enough parts to do both ailerons on one wing. The aileron is cut out from the stock GWS molding on the back of the wing. Here is how I did it. 1.Press hobby pins through the color side at the corners of the aileron hinge line depression molded into the wing. Glue a balsa block to the side of your hobby knife so only about 1/8" of the blade sticks past the block. This block becomes a stop for the next step to stop you from cutting too deeply. Flip the wing over and put a steel straight edge against the pins (we are now working from the white or bottom side of the wing). Use your altered hobby knife to slice the foam from pin to pin in a straight line without piercing through the top surface or colored skin of the wing. 2. Line up a steel straight edge on the top surface of the wing and cut the cordwise lines (those going for and aft) at the ends of the aileron. 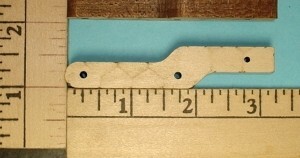 Once cut, Move your rule over about 1/32" and take an extra sliver out. This way the edges of the aileron won't touch and bind as it moves back and forth. 3: Aileron is now free. Flex the aileron towards the colored side and the foam will crack up (from the bottom) to colored skin. 4: Hold the aileron so it's vertical or 90 to the top surface and use a sanding bar to sand the hinge line down flat so that both the wing and the aileron end up with a 45 degree bevel in the hinge line. BUT WAIT! When you sand, do so carefully, as you see the color (of the top surface skin) begining to peek through the foam, stop sanding. You don't want to cut this skin. The top skin becomes a living hinge. I added Blenderm tape to the bottom of my hinge line while it was flexed up to make sure I had a durable hinge. Step 5 Warning! Your making each wing a mirror image of of the other, look carefully so both servos are placed opposite each other, pads are betweed same ribs and offset to similarly relative to the center of the wing. 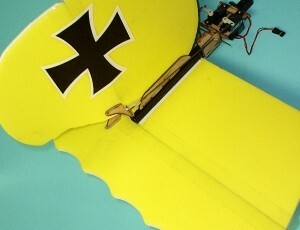 5: Glue servo pad to wing. GWS foam glue or any other foam safe CA may be used. After the pads are cured, glue your servos to the servo pad. Cut the slot in the aileron so the holes in the horn are lined up over the hinge line you just cut in. Use the spacers (one long one aginst the foam) so the when the clip is installed the horn is snug. Remove, add glue and put back together. Make pushrod from .055 wire (same stuff used for slow stick pushrods) and your done. Linkage and horns required to drive rudders on a twin vertical fin tail. Handy parts to simplify setup on an otherwise complex tail configuration. Horn set includes rudder horn. Dry assemble all parts to be sure linkages are not going to interfer with each other. Look at photo. 120 degree V-Tail Mounting Kit. Precision, laser cut quick build kit. She'll fly like an Angle but won't look like everybody else's hound after making this mod. The V tail is made from just one stock Horizontal stabilizer cut in 1/2. A slight V notch needs to be crafted in the elevator portion as shown in the photo. Comes with nice light weight nylon hardware. You'll need a radio with "Elevon" mixing (or open mixes available) to get both controls on the right stick (mode 2 for us Yankees). If your radio lacks this feature it is available on our site as a carry onboard electronic device. 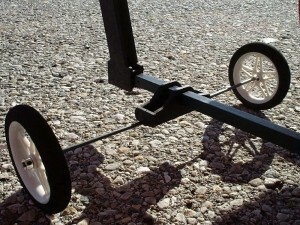 Of course, you'll want a real tail wheel mount or go tricycle gear like I did. These parts go nicely with the V tail mount and are available in this category. Slow Stick Canard made easy! This all-in-one unit will mount your horizontal stab and allow angle of attack adjustments to suit your special setups. Most canards should be set to between 3 and 5 degrees positive. Range of adjust ment is from 0 to 7 degrees positive. Elevator servo moves with the canard mounting surface so your elevator adjustment stays the same relative to your canard when you alter the angle of attack setting. Mount has built in nose gear block and nose gear steering servo mount. All holes are predrilled. Includes high quality socket head hardware needed to complete. My personal Slow Stick Canard is a twin tractor. I have a 1000mm boom length and the CG is set at 1-1.25" in ffront of the main wing leading edge. I have never built one with a stock boom length (800mm) but I would start with the CG in the range of 0-.5" in front of the leading edge. The shorter the boom the further the CG comes back, the longer the further forward you would place it. I don't know where Bob Masterson's CG is set but I would thing it is similar to my 1000mm boom setup. Maiden Flight Video of Bob Masterson's converted Canard Slow Stick. This model is full house with 10" extended boom length. Slow Stick Canard from Bob Masterson on Vimeo. Designed to help making twin vertical tails simpler. Perhaps your building a faux Warthog and need a simple way to mount your verticals to the ends of your squared off horizontal stabilizer. Here is the part set to make it easy. Other uses possible as well. Enough parts to make 2 L channel brackets. Square jigs make for a perfectly straight glue up every time! Drilled for 4-40 nylon bolts/nuts (not included). Tired of that out of kilter look you get from an off center tab? Maybe you just don't want reglue your stab from time to time as often happens. This little kit builds into a U channel perfect for your stab. Glue or cross pin your stab in. Pre-drilled holes in base are correct diameter to thread 4-40 socket head bolts. These can be the same bolts that hold your conventional horizontal stabilizer on. Also, a must if your converting to T tail. There is no stronger way to mount the vertical stabilizer. Slow stick parts come in both 4 and 5 mm. 4mm is .157" or pretty close to 5/32". 5mm is a little over 3/16" at .197". Measure your parts before ordering. The Stab kit has only 3 working parts. A bottom and 2 sides. The other two parts are alignment jigs. 1. Gently press the two sides onto the bottom (the bottom is the thick part with the two holes in it, the part you see best in the photo above is a side.) You'll notice there are matching finger joints between the parts. Finger joints are notches that fit together tightly. Get the 3 parts roughly square and uniform forming a U channel. 2. 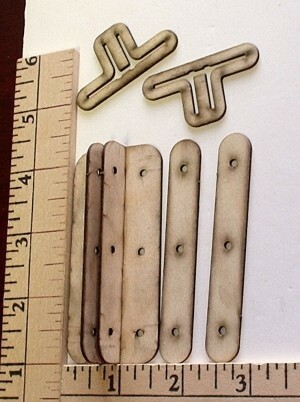 The other two parts that look like retangles with a "U" cut out in them are alignment jigs. You press these over the ends, wiggle them on carefully, one from each end until each is about 1/2" or so in from the end. The jig holds the 2 sides in perfect alignment with the bottom. Wick some thin CA into the finger joints between the the bottom section and each of it's two sides. Be careful not to glue your alignment jigs to the Stab Mount. 3. Pull the alignment jigs off and discard. 4. Slip your vertical into the stab mount. If it's a little bit loose (the foam they use has some varience in thickness) just add a layer or two of masking tape to the stab unti it's thick enough to be lightly snug. 5. Place the stab and it's mount onto your boom and notice how the bolts that hold the horizontal stab on will thread into the base plate of the stab mount. Notice additionally that your rudder is higher so you can get more elevator throw without contacting the rudder if you wish. Also, you locate the stab a little further forward in the mount to get even more elevator travel opened up if you want. 6. After finding the right location to glue your stab into the mount, Use Foam Safe CA or better yet the included GWS slow dry foam safe tube of glue to glue the stab into the slot. 7. Once the glue is dry, remove the nuts from your stab bolts. Now hold the stab in place as vertical as possible as your turn the screws from beneath the horizontal stab. Once everything is snugged up, reconnect your pushrod linkage and you've got a rock solid stab that's not going to come off and plenty of extra travel for your elevator. Tired of that out of kilter look you get from an off center tab? Maybe you just don't want re-glue your stab from time to time as often happens. This little kit builds into a U channel perfect for your stab. Glue or cross pin your stab in. Pre-drilled holes in base are correct diameter to thread 4-40 socket head bolts. These can be the same bolts that hold your conventional horizontal stabilizer on. Also, a must if your converting to T tail. There is no stronger way to mount the vertical stabilizer. Use to mount your own custom 6mm depron vertical fins. Finally it's easy to convert to a T tail. Complete with washer plates. Glue to your stab and horizontal or use 4-40 nylon bolt/nuts in the pre drilled holes. May also be used for mounting verticals to the ends of your stab. Works with any 4mm foam. If using with stock Slow Stick parts, trim the top of the vertical down until you have a flat spot long enough for this mount. Comes complete with washer plates to prevent bolt damage to surfaces. Slow stick parts come in both 4 and 5 mm. 4mm is .157" or pretty close to 5/32". 5mm is a little over 3/16" at .197". Measure your parts before ordering. One photo shows used as base for vertical fin which we mounted to center of wing for our twin tractor canard model in the shop. Finally it's easy to convert to a T tail. Complete with washer plates. Glue to your stab and horizontal or use 4-40 nylon bolt/nuts in the pre drilled holes. May also be used for mounting verticals to the ends of your stab. Works with any 5mm foam. If using with stock Slow Stick parts, trim the top of the vertical down until you have a flat spot long enough for this mount. Comes complete with washer plates to prevent bolt damage to surfaces. Slow stick parts come in both 4 and 5 mm. 4mm is .157" or pretty close to 5/32". 5mm is a little over 3/16" at .197". Measure your parts before ordering. 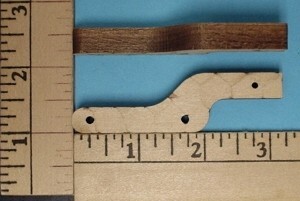 One images shows part being used to mount a fin to the center of the wing on our Twin Tractor Canard model in the shop.